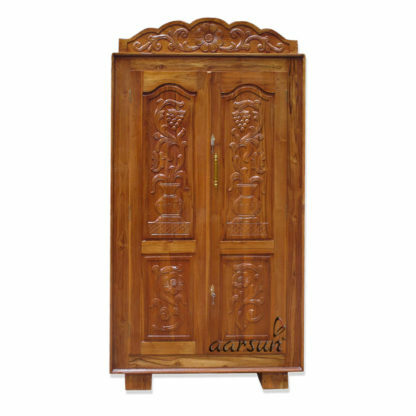 Aarsun Woods have a wide range of Wooden Wardrobe for all kinds of homes – be it a traditional home or a designer modern home. 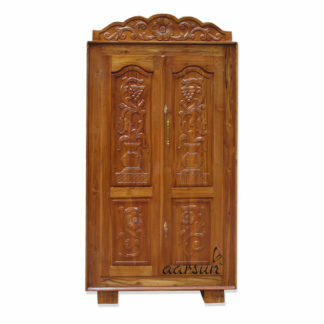 The Wardrobes are made to order design and are highly customizable according to your need. From the fantastic collection of wardrobes, comes a uniquely designed Handcrafted Wardrobe Two Part Almirah that is made specifically for those who wants to share the wardrobe and the same time wants some sort of privacy and space. This simple yet impressive design makes a single wardrobe into two separate almirah that can be used by two persons at the same time. 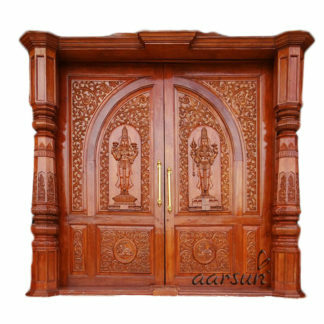 The product is traditionally handcrafted by skilled artisans in premium quality Sheesham Wood with Floral Designs carefully carved out in front Panels with natural wood polish. The Upper Part is larger than the lower part. The Upper part can have a single shelf or no shelf and the lower part can have a single horizontal shelf or 3 equally spaced vertical compartments for Books or Office Files. It entirely depends on the ease of use and your requirement. You can have the Wardrobe made in any size you need.